Newer date are available for 2011. Please visit the IVAA-Homepage for the update! Anthroposophic medicine is a holistic and salutogenetic approach to medicine focusing on strengthening the patient's organism and individuality. The self-determination, autonomy and dignity of patients are central themes. Therapies are intended to enhance a patient's capacities to heal and include anthroposophic medicines as well as various art therapies like painting and sculpture therapy, music, singing and speech therapy, physiotherapy and massage, psychotherapy, curative education and social therapy - and eurythmy therapy, where special body movements are used for therapeutic purposes. Currently there are about 4,800 trained anthroposophic doctors, who are members of national associations of anthroposophic doctors. Based on the number of prescriptions it has been estimated, that anthroposophic medicinal products are prescribed by more than 30,000 physicians in 21 of the 27 EU member states, as well as in Norway and Switzerland. Recognition of anthroposophic medicine is subject to extreme variations between EU Member states. The level of recognition extends from statutory integration as specific therapeutic system within national law (Germany and Switzerland) to special exemption where anthroposophic medicine is only allowed to be practised within the context of a particular clinic (Vidarkliniken, Sweden). With the exception of Germany, where anthroposophic medicine is defined as “special therapeutic system” [Besondere Therapierichtung] in the Code of Social Law (Sozialgesetzbuch 5), and Switzerland, where anthroposophic medicine is defined as part of CAM under constitutional law, legal recognition is restricted to pharmaceutical regulations in some of the member states (see below). Only in Germany anthroposophic medicine is recognised as a distinct therapeutic system under statutory regulations. 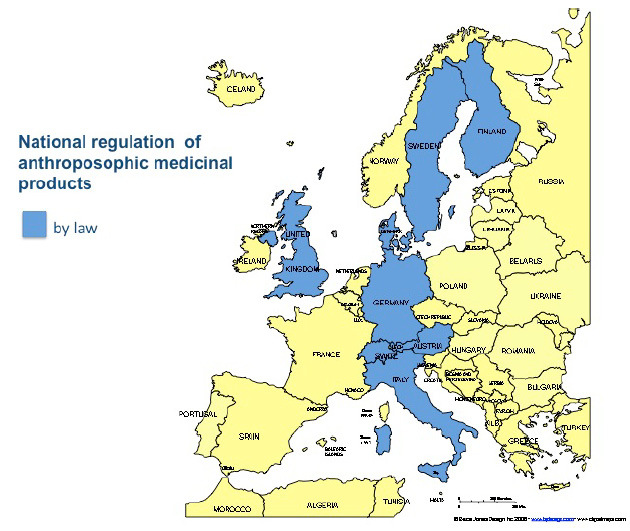 In Denmark, Finland, Sweden and the UK, anthroposophic medicinal products (AMP) are mentioned to varying degrees in national pharmaceutical laws in particular in connection with simplified registration procedures for homeopathic medicinal products. In Sweden the anthroposophic clinic (Vidarkliniken) has a permit from the Minister of Social Affairs, but doctors are only allowed to practise anthroposophic medicine if they do so at, or in connection with the Vidarkliniken. As mentioned above, in some countries where the government delegates the tasks of authorisation, registration and supervision of practitioners to national medical associations, statutory regulation of anthroposophic doctors requires an ‘additional qualification’ issued by the medical association/council/chamber (Austria, Bulgaria, Germany, Latvia and Switzerland). 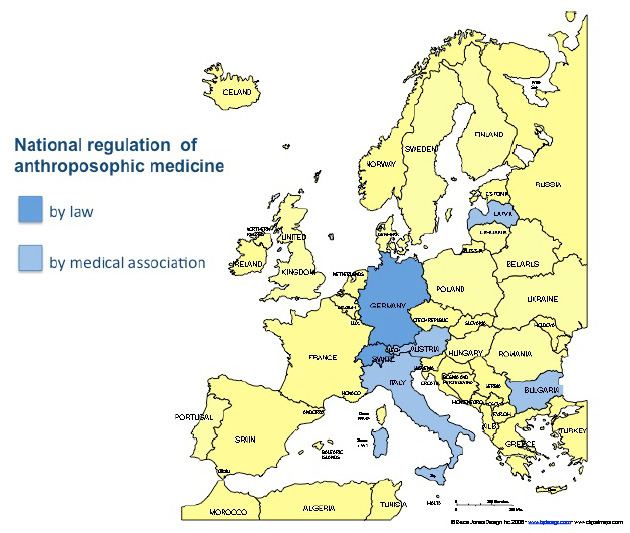 In Italy anthroposophic medicine is recognised through statutory regulation by the local medical associations/chambers/councils in Bologna, Terni and Palermo. Diplomas for anthroposophic doctors are issued after satisfactory fulfilment of the required criteria for training and qualification in anthroposophic medicine. In all member states with training institutions the curricula are established under the auspices and supervision of the national association of anthroposophic doctors. In most EU member states, diplomas for anthroposophic doctors are issued by the national associations of anthroposophic doctors. In Austria and Switzerland such diplomas are issued and recognised by the national medical associations/chambers/councils. In Bulgaria, Germany, Italy, Latvia and Spain the diplomas are issued by the national association of anthroposophic doctors and recognised by the national medical associations/chambers/councils. In Belgium, Finland, France, Hungary, Netherlands, Poland, Romania, Sweden and the UK diplomas in anthroposophic medicine are not recognised. In member states without national training facilities, doctors can apply for international certification which is issued by the Medical Section at the Goetheanum in Dornach. The criteria for this international certification have been worked out and agreed by the International Federation of Anthroposophic Medical Associations. Doctors can also apply for the international diploma in member states where national training facilities exist. However, this is possible only by authorisation of the national association of anthroposophic doctors. University professorial chairs for anthroposophic medicine are established at universities in Germany (Witten-Herdecke and Alfter), and within the context of CAM in Italy (Firenze and Bologna) and in Switzerland (Bern). Introductory courses in anthroposophic medicine are offered as an optional part of the medical undergraduate curriculum in Austria, Germany, the Netherlands, Spain, Sweden and Switzerland. The courses are usually integrated into courses on CAM in general. Postgraduate medical training courses in anthroposophic medicine are provided at private teaching centres in Austria, Denmark, Finland, France, Germany, Hungary, Italy, Netherlands, Poland, Romania, Spain, Switzerland and the UK, usually under the auspices of the national associations of anthroposophic doctors. Anthroposophic medicine is provided in several hospitals across Europe, mainly in Germany, Italy, the Netherlands, Sweden, also in the UK and Switzerland. Anthroposophic therapies such as eurythmy therapy (a special movement therapy), artistic therapy (painting, modelling, singing, music), therapeutic speech, anthroposophic physiotherapy and rhythmical massage, and anthroposophic nursing etc. are an essential part of anthroposophic medicine. Every therapist is well trained according to curricula specific to the respective therapy. A special feature of anthroposophic medicine is that these therapists provide their skills/services in accordance with a medical prescription from a doctor, as part of the integrated anthroposophic approach to medicine. 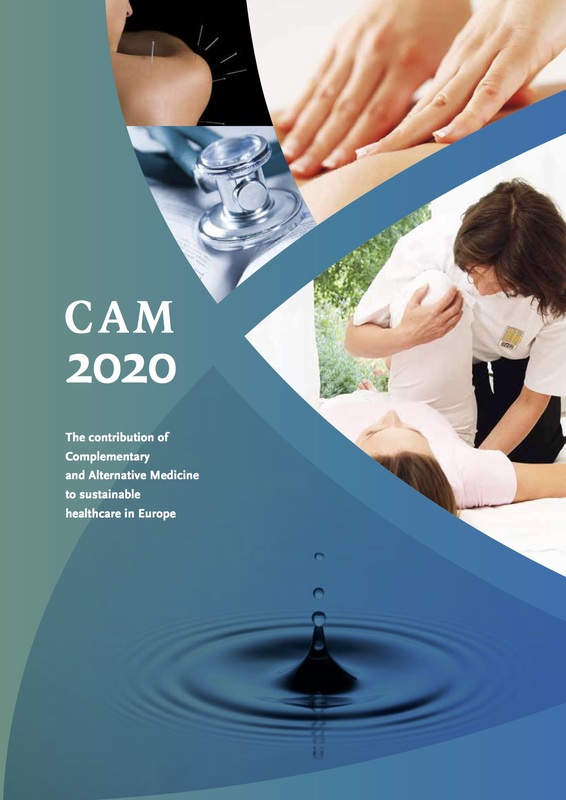 Continuing Medical Education in general (conventional) medicine is obligatory for all medical doctors in Belgium, France, Italy, Latvia, Lithuania, Slovakia (controlled by the government) and in Austria, Bulgaria, Czech Republic, Germany, Hungary, Lithuania, Poland, Romania, Slovakia, Slovenia, Switzerland and the United Kingdom (controlled by the national medical associations/chambers/councils). In addition, the national associations of anthroposophic doctors in Germany, Hungary, Netherlands, Romania and Switzerland require their members to complete significant numbers of hours of CME in anthroposophic medicine. Anthroposophic medicine is an official part of the Continuing Education Programme (CEP) for doctors in Germany, Romania and Sweden. Anthroposophic medicinal products are on the market in certain EU member states under registration procedures that predate EU framework legislation for medicinal products for human use. The EU Community Code relating to medicinal products for human use does not recognise AMP, whereas it does, for example, recognise homeopathic MP via special simplified registration procedures. This has far-reaching consequences for marketing authorisation and registration of AMP within the European Community. Only one third of AMPs – those manufactured in accordance with homeopathic pharmacopoeias - and another third of AMPs – those which meet the criteria for traditional medicinal herbal products (restricted however to oral or external use without indication) - can be registered under simplified registration procedures. Under procedures of the Community code relating to medicinal products for human use, over 40 percent of AMP - encompassing the majority of AMP prescribed by doctors, with indications, and administered other than orally or externally - require market authorisation similar to that for conventional pharmaceutical products. These procedures, however, do not take account of the special features and manufacturing methods of AMP, and are therefore not appropriate. In Finland, France, Germany, Netherlands and Sweden fees for consultation with an anthroposophic physician are reimbursed by the national healthcare insurance system. In Austria, Belgium, France, Italy, Netherlands and Switzerland they are covered only by additional private insurance companies, with only partial coverage. Costs for anthroposophic medicines are covered by the national healthcare insurance system in France, Germany and Sweden and the UK, and by additional private insurance companies in Austria, Belgium, Denmark, France, Germany, Italy, Netherlands and Switzerland. There is only partial coverage, or up to a certain maximum, in Belgium, Denmark, France and Netherlands.